The high schooler then attempted to defend himself, saying he was goaded into harassing the Native American man. This Saturday, the internet woke up to a rude pained reminded that the country we live in rife with so many pockets of bigotry who are there to make life for people of color all the harder in this country. 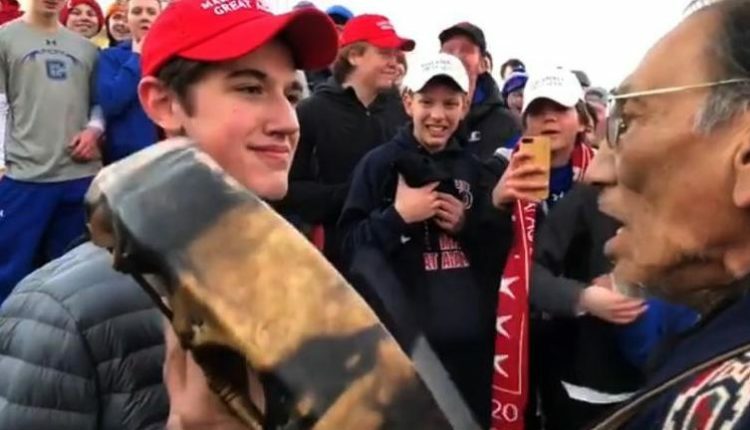 This weekend, a video began going around of people who visited the March For Life anti abortion get together in Washington DC, of students from Covington High School, a Catholic High School in Kentucky, harassing a Native American elder with a smug smile on his face as the elder continued to drum in a peaceful manner. The video has correctly outraged the world towards these kids, and every video that comes out of the situation proves more and more racist than the last. Here’s the one that went viral..
…and here’s more from the event that shows that the kids were being racist as hell the entire time. The Native American man’s name was Nathan Phillips, a Vietnam war veteran, and in a touching clip going around the internet, he gives a speech about the foolishness of walls, saying that for millennia America didn’t need walls, it never did, and he sheds a tear as he recalls the harassment he receives at the hands of the racist high schoolers. He then mentioned that he wishes hat the kids who put their energy into white nationalism would instead put their energy into making the country actually great — helping those who need it most and helping those who are hungry. And as many on Twitter pointed out, we all know that high schooler’s, Nick Sandmann’s grin. That’s the grin of the leering bully who adores being cruel. It’s the grin of the leering creep who thinks he can get away with whatever disgusting thing he thinks he can do, and since the video came out the leering creep has went into overdrive to try to prove that he was in some way actually the aggrieved one in this interaction that, again, is caught on camera showing him bullying an old man. I never interacted with this protestor. I did not speak to him. I did not make any hand gestures or other aggressive moves. To be honest, I was startled and confused as to why he had approached me. We had already been yelled at by another group of protestors, and when the second group approached I was worried that a situation was getting out of control where adults were attempting to provoke teenagers. I believed that by remaining motionless and calm, I was helping to diffuse the situation,” he said. “I realized everyone had cameras and that perhaps a group of adults was trying to provoke a group of teenagers into a larger conflict. I said a silent prayer that the situation would not get out of hand. Ugh. Anyone who has ever been bullied knows this kind of rhetoric well. This is what the abuser says to try to prove he was innocent, by trying to play themselves off as the victim despite everyone seeing otherwise. Even if he wasn’t moving, he was leering at the man, standing in his way. No words were sad, one of his friends was recording him. He knows he was trying to harass the man, and much like Kavanaugh before him, is outraged that he has to feel any consequence. The video shows who was harassing whom, and people can believe this teenager trying to defend himself or they can believe their own eyes. I recommend your own eyes. They’re much less biased. Likewise, a video that some conservative parts of the media thanks makes Nathan look bullied, doesn’t show him not acting like a creep. It does not absolve him in the least.